One of the many problems the Russian government faced upon the collapse of the Soviet Union was access to space launch facilities. Baikonur Cosmodrome, the largest Soviet space center, was in the newly-independent Kazakhstan. An approximate map of Svobodny area. Click with the right mouse (PC) or control click (Mac) to invoke interactive menu. During 1991-1993, negotiations over the status of the facility were not easy. Russia turned to Plesetsk, as its "heartland" space center, however its geographical location limited payloads and the range of orbits accessible from the site. Besides, Plesetsk has never had launch pads for the heavy Proton launcher, the backbone of Russian space commerce. In 1993, three potential sites emerged, all in the Russian Far East, the only region which could offer a latitude comparable to Baikonur's southern location. 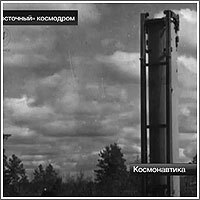 Eventually, coastal Sovetskaya Gavan and the town of Khorol, some 150 kilometers from Vladivostok were dropped in favor of Svobodny 18, a former strategic missile base. It was located 120 kilometers north of Blagoveshensk and was shut down, as a result of the START-2 agreement on strategic arms limitations. The base was originally built in 1968 and shut down in late 1993. As many as 100 silos were built in the region, with coal mining as a cover story. The residential area of the facility reportedly provided housing to 5,000 people. An existing railway line, a paved road and a power line connected the site with the rest of the region. Although the division of the Strategic Rocket Forces stationed in Svobodny 18 had been disbanded, the town still had a population of 6,000 and all the basic infrastructure for its new role. Five or six existing launch silos could reportedly be easily modified for the Rockot launch-vehicle based on the UR-100 ballistic missile. When these plans became known, few took them seriously. The collapsing state economy left little chance to finance such a project. Many observers saw the idea as a bargaining chip at the negotiation table with Kazakhstan. On November 30, 1993, the Ministry of Defense officially formed the "Main Center for Testing and Application of Space Assets" in place of the deactivated base at Svobodny. The plans called for the restoration of as many as five launch silos for UR-100-type missiles, which could be used for Rockot and Strela launchers. 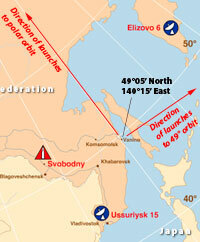 Both space boosters derive from the UR-100NU ICBM, previously deployed at the base in Svobodny. There were reports in the Russian press, that the idea about Svobodny had gotten a cool reception at the Russian space agency. The civilian organization believed that scarce resources would be better spent by supporting existing facilities, while the military argued that investment in Svobodny could help them employ retired military personnel. As of 2007, the Russian press estimated the population of the "cosmodrome" at around 4,000 people. Postings made by local residents on a regional web forum testified that the living conditions in the closed town of Uglegorsk (essentially a residential area of the missile base) were generally good and even during the post-Soviet period, there was little crime and parents were not afraid to let their children to be outside alone. Finally, on March 1, 1996, President Boris Yeltsin signed a document declaring Svobodny a "Cosmodrome." During 1997, such organizations as the KBTM and KBOM design bureaus, specialized in launch equipment; KB Salyut, the development arm of Khrunichev enterprise, and KB Motor, specialized in transport equipment for the space industry, were involved in the project. During 2000, NPO Mashinostroenia, was still at the initial stage with its plans to convert the launch silos in Svobodny for its Strela booster. The company representatives said that the first Strela launch could take place as early as 2001, however, the initial test missions would fly from Baikonur, rather than Svobodny. The previously envisioned construction of the two-pad complex for the prospective Angara launcher had also remained at a virtual standstill during the end of 1990s due to lack of funds. Still, beginning in 1997, the launches of the light-weight mobile Start-1 booster were conducted from the former Site 5 of Svobodny for commercial purposes under the auspices of ZAO Puskovye Uslugi, essentially the commercial branch of the Moskovsky Institute Teplotekhniki, the developer of the Topol and Topol-M ICBMs. In September 2005, the Russian press quoted space agency officials as saying that due to lack of funds, the launch facility at Svobodny would shut down upon completion of already scheduled missions. According to a 2007 report in the local edition of the Kommersant newspaper, revenues from a single commercial launch from Svobodny would reach around 7.5 million rubles, while the maintaining the facility would cost the federal government 177 million rubles. Still, a representative of the Russian president in the Far East, Kamil Itskhakov, who visited the site for the launch of the EROS-B1 satellite in April 2006, promised to lobby for the continuation of space launches at the site. The governor of the Amur Region, Leonid Korotkov was also quoted as saying that payments from the Russian military for the environmental cleanup in the aftermath of launches were significantly increased from the original 75 thousand rubles. On January 22, 2007, the head of the Russian space forces, General Vladimir Popovkin confirmed that the launch facility in Svobodny would be mothballed. He added that a military unit and a ground measurement station would remain at the site, while "only time would tell about anything else." Only about 300 military personnel would be required to maintain the ground control station and associated facilities, according to the Russian press. In February 2007, a presidential decree formalized the closure of the launch facility in Svobodny. According to the Russian press, in the previous three years, government investments in Svobodny reached 350 million rubles. On June 6, 2007, a group of Russian military officials led by newly appointed Defense Minister Anatoly Serdukov visited Svobodny to discuss the fate of the site with the presidential envoy to the Far East Region, Kamil Itskhakov, who had long lobbied for keeping the facility in service. New launch site in the Far East? The fate of Svobodny got another chance for a reversal of fortune on July 31, 2007, when a federal interagency commission, which was led by the head of the Russian space agency Anatoly Perminov and included 24 to 90 people, according to different reports, visited the town of Uglegorsk. The official purpose of the group was to search for a new potential far-eastern launch site. (The head of the Russian space agency, Anatoly Perminov first mentioned the possibility of building a new launch site in Russia during his visit to Kourou at the end of February 2007.) Members of the commission visited different facilities in Svobodny and flew downrange in a helicopter. Like during the 1990s, Svobodny was again competing with the Port of Vanino near Sovetskaya Gavan in the Khabarovsk Region on the Russian Pacific Coast. At the time, Russian media promised a presidential decree on the creation of the new launch site by the end of August 2007. All indications were that the commission favored an area between Sovetskaya Gavan and Vanino, while Uglegorsk was apparently included in the list of closed cities to be demilitarized and open to general access by the public and for the civilian development. The same commission visited Vanino on Aug. 1, 2007. During the MAKS-2007 air and space show in Moscow in August 2007, the head of Russian space agency, Anatoly Perminov, reiterated that Russia would need a new space launch site in the future, particularly for prospective manned systems, however he stressed that the issue of its location remained open at the time. Later, publications said that locations near Ussuriysk and Vladivostok had been rejected due to the need to drop spent stages over Japan and China, while sites on Sakhalin Island and near Sikhote-Alinsky gorge lacked even the most basic infrastructure. During his visit to the Russian Far East at the end of September 2007, the first vice prime-minister, Sergei Ivanov, confirmed once more his government's decision to shut down launch operations in Svobodny, while reiterating intentions to find a new launch site in the region. Ivanov added that the new launch site in the Russian Far East would be available for manned launches among other missions. According to Ivanov, the government's strategic policy of bringing high-tech industries to the Russian Far East gave the region an advantage over other places in the selection process. Another twist to the story of the Far-eastern launch site was added in November 2007, when the head of Roskosmos Anatoly Perminov essentially ruled out Vanino from the list of potential locations, citing the area as earthquake-prone. He promised that the final selection would be made in January 2008, adding that the Amur Region (Amurskaya Oblast) was now favored. The Amur Region also boasted on average 310 clear days a year, a relatively dry climate and a lack of strong winds. Also, the price tag for new launch port at the existing site in Svobodny was estimated to be 180 billion rubles, while the cost of a newly built site on the Pacific Coast would reportedly reach 380 billion. According to Perminov, the new facility would only be necessary after 2020, upon conclusion of the Russian involvement in the International Space Station project, which was dependent on the launch site in Baikonur. On Nov. 21, 2007, official Russian media, citing Sergei Ivanov, the first vice-chairman of the Russian government, announced that on Nov. 6, 2007, President Putin had signed a decree on the creation of the Vostochny ("Eastern") launch site in the Amur Region. If ever built, the new launch site would mark a historic shift of the nation's manned space program from Baikonur Cosmodrome in Kazakhstan to Russian territory. Once again, the creation of a new launch site aimed to end Russian dependency on Kazakhstan, whose government charged multi-million-dollar annual fees for the rent of Baikonur. In addition, with new investments in the Russian Far East, the Kremlin hoped to tighten its grip on this remote region of the country, which in the last decade has seen considerable economic influence from China and Japan. Along with the construction of the new launch site, the Russian government had promised to relocate high-tech enterprises, supporting the manned space program into the region. From the outset, the government advertised Vostochny as a civilian facility with its focus on the manned space program, particularly on Russian plans for lunar expeditions. Military launches of reconnaissance satellites, heading to high-inclination and polar orbits, would continue originating from Plesetsk. Vostochny's geographic location (near 51 degrees North latitude) ensured that rockets would be capable of lifting almost the same amount of payload, as they could carry from Baikonur. As a result, the future site could provide access to the International Space Station, (if it was still in orbit at the time), and, possibly, support missions to the Moon. Therefore, it was assumed that new-generation rockets, such as Soyuz-2-3, Soyuz-3, or an entirely new family of launchers would be based in Vostochny. At the same time, Vostochny could be a base for commercial missions, targeting both low and high-inclination orbits. Initially, it was unclear, if military launches heading to equatorial or low-inclination orbits would be also relocated to Vostochny. Traditionally, the Baikonur-based Proton rocket has delivered military communications and early-warning satellites, which required equatorial orbits. However, the new-generation Angara rocket would be seriously impaired in terms of its payload, if it had to reach equatorial orbit from Plesetsk, due to its high-latitude location. Thus, a launch pad for Angara or its derivatives in Vostochny could become attractive for both commercial and military users. However, in this case, the Russian-Kazakh Baiterek project aiming to bring Angara to Baikonur, which is located at roughly the same latitude, would become redundant. In addition, during the July 2008 review of the project, Makeev Rocket Center, GRTs, also presented its concepts of launch vehicles for the Vostochny project, including Viktoria, with 125 tons of payload and the partially reusable Rossiyanka with 20 to 40-ton capacity. GRTs also offered the light-weight Shtil converted ICBM and the Vozdushny Start concept to be deployed in Vostochny. Finally, a prospective reusable launch vehicle, MRKS-1, would be another likely candidate for Vostochny. According to the local newspaper, Amurskaya Pravda, the development of the new site would dramatically increase employment in the towns of Uglegorsk, Svobodny and others. 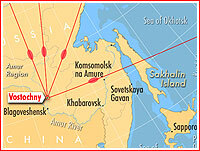 (As of the beginning of 2008, the exact location of Vostochny's main facilities was unclear and their boundaries were not expected to be determined until 2009.) Preliminary development of the project, geodesic surveillance and related work was expected to take more than a year. The construction would reportedly employ around 25,000 people. According to preliminary data, the development cost would reach 180 billion rubles, the newspaper said. For obvious reason, the 2005 budget of the Federal Space Program did not allocate a single ruble for the construction of the new launch site, and the local authorities indicated in 2008 that they planned no investment in the project from municipal budgets, leaving it to the federal government. The residential construction would be followed be breaking ground for the actual technical infrastructure of the launch site in the second half of 2009. An airfield would reportedly be the very first facility to be built in Vostochny. In May 2008, the head of Roskosmos, Anatoly Perminov, said that no less than 42 months (3.5 years) would be required for the survey and design work at the new site. The first public information on the funding of the launch site appeared on September 12, 2008, in the aftermath of an official meeting between the then Chairman of the Russian government Vladimir Putin and his deputy Sergei Ivanov. According to the officially released transcript of the meeting, Ivanov submitted the draft of a request for the adjustment of the Federal Space Program. It asked for an additional 45 billion rubles over the next three years, at least part of which would fund the initial stage of development of the new space port. To fulfill the government idea of accompanying the construction in Vostochny with the overall shift of space industry to the Far East, Nikolai Sevastyanov, the newly appointed deputy governor of the region, fielded the idea of opening in Uglegorsk a design bureau specialized in the development of small satellites. Such satellites could serve as potential payloads for the Start booster, whose operations had been based in the Svobodny/Uglegorsk region since the mid-1990s. The new bureau could be staffed by local specialists who would be trained in the leading educational institutions in Russia, Sevastyanov told the Amurskaya Pravda in January 2008. In addition, the Moscow Aviation Institute, MAI, a leading supplier of graduates to the Russian space industry, was reportedly ready to open a branch in the Amur Region. In June 2008, Viktor Moiseev, a head of flight vehicle department at the Korolev Aerospace College in Samara visited Blagoveshensk and Uglegorsk, scouting for potential candidates for the first group of 10 students from the Far East. The highly regarded aerospace engineering school prepared to face the challenges of recruiting from the Far East, as according to Moiseev, none of his interviewees in Uglegorsk had taken Standardized State Test in mathematics, physics or information technology. Also in 2008, rocket manufacturers reviewed the possibility of bringing their work into the region. The Gagarin aviation plant, manufacturing Sukhoi fighter jets and located in Komsomolsk-na-Amure, was cited as a potential candidate for rocket production. At the same time, the Russian press also quoted some unnamed officials who believed that the future launch site would not need residential area and that all launch campaigns would be conducted by visiting shifts of specialists. It was unclear where these teams would be based. Just few weeks after the Russian government had announced its intention to build Vostochny, regional media reported that South Korea would be interested in the development of the site. According to Amur-Info, Korean officials attending the meeting of the Russian-Korean commission on economic and technology cooperation in Vladivostok in December 2007 said that their country would support the project, which could eventually result in launches of Korean satellites from the site. In 2010, the Russian presidential envoy representing the Far-Eastern district also discussed possible French involvement in the development of the launch facility with the French ambassador to Russia. On July 5, a French delegation arrived to Khabarovsk to discuss economic cooperation with the region. At that point, potential “cooperation” on Vostochny apparently included logistics and transportation support by French companies. It was unclear whether any technical cooperation was actually discussed. In November 2013, on the eve of his visit to South Korea, the Russian President Vladimir Putin renewed the idea of Korean participation in the construction of Vostochny in an interview with Korean Broadcasting Service, KBS. While Moscow officials discussed their grand plans for Vostochny, local officials in Uglegorsk warned that new funds would be needed soon if the existing infrastructure was to be preserved for its future role. Although during 2008, the town of Uglegorsk mostly retained its good shape, the surrounding infrastructure started deteriorating quickly. The Russian space agency apparently dragged its feet on taking over formal responsibility for the Svobodny facilities from the military. In October 2008, the mayor of Uglegorsk, Vladimir Tokarev, complained that the Ministry of Defense had failed to transfer the remaining infrastructure of the former Svobodny launch site to the municipal authorities. As a result, a hospital and a community center, among other facilities, were cut off from all utilities and left to decay. According to Sergei Zhukov, a representative of the Technology Transfer Center, quoted by ComNew.ru, scavengers, including municipal entities dismantled around eight kilometers of the concrete section of a 30-kilometer paved road leading from the town to the technical facilities. On the local market, the concrete sections of the road would reportedly go from four to seven thousand rubles, depending on their size. Mayor Tokarev did confirm that the concrete road leading to the site had been dismantled and left in an essentially unusable condition. Along with it, a railway line, which was used to transport propellant to the launch site, was classified as damaged and had remained shutdown since February 2008. In the meantime, the military contingent, which was formally responsible for the maintenance of the infrastructure practically ceased to exist, due to lack of personnel. Even top officers at Svobodny, including the chief of the launch site and the chief of staff, among others, had no permanent housing or formal re-assignments. As a result, rank-and-file military personnel and civilian contractors were leaving the site in search of new jobs. By May 2008, out of 2,000 military officers, who served at the site, only 500 remained. Inside Uglegorsk itself, the completion of a stadium, which has been under construction since 2005, was pushed back from 2008 to 2015. The price tag for the project ballooned from 50 million rubles to 300 million, while funding was continuously delayed. During a visit to the Vostochny area at the beginning of December 2008, the Presidential Envoy to Far Eastern Federal District, Oleg Safonov, admitted that the implementation of the plan for the development of the launch site had been conducted unsatisfactorily. On Jan. 15, 2008, Russian media announced that the governor of the Amur Region, Nikolai Kolesov, had appointed Nikolai Sevastyanov as deputy chairman of the region's government. It is likely Kolesov discussed this appointment during a meeting in Moscow with the management of Roskosmos on Dec. 28, 2007. Only a few months earlier, the Russian space agency had forced out Sevastyanov from the prestigious post of head of RKK Energia, the prime developer of Russian manned spacecraft. In his new capacity, Sevastyanov would reportedly lead all activities related to the development of the new launch site in the remote Far East. One witty comment on a Russian web forum compared Sevastyanov's new assignment with an appointment as ambassador to Mongolia -- the Soviet equivalent of honorary exile. By the time of his appointment, Sevastyanov had already paid a two-day visit in Uglegorsk, touring all the major facilities at the site. Concurrently with Sevastyanov's appointment, Governor Kolesov signed a decree creating a scientific and production committee on the construction of Vostochny. The new body would include representatives of the rocket industry and would be responsible for coordinating all aspects of the project. According to the official Interfax news agency, during a meeting of the Russian president with his cabinet on Jan. 21, 2008, the vice-chairman of the government, Sergei Ivanov, said that Roskosmos would initiate the development of Vostochny during 2008. The issue was expected to be discussed at the meeting of Roskosmos' council on Jan. 23, which Ivanov would personally chair. Representatives of the Amur Region, including vice-governor Viktor Martsenko, the head of Uglegorsk area Vladimir Tokarev and Nikolai Sevastyanov, a newly appointed deputy to the Amur governor, were all expected to attend. On Feb. 11-14, 2008, a combined team of Roskosmos, rocket industry representatives and local officials toured the potential locations of the future center, in an effort to clarify the list of existing facilities at Svobodny which could be re-used in a new role. Two weeks later, on February 27, Roskosmos leadership held a meeting considering the status of the project. The agency announced that a technical assignment for the general design of the new center had been issued to TsNIIMash research institute. At the time, the Scientific-Technical Council of Roskosmos was expected to review the design in June-July 2008. Roskosmos also announced a formation within the industry of working groups assigned to deal with various aspects of the project. The overall responsibility for the construction of the new site was expected to be delegated to Spetstroi, a key contractor on major development projects of the Ministry of Defense. On March 28 and 29, 2008, management at Roskosmos and Spetstroi held back-to-back management meetings on the issue of Vostochny. The head of Spetstroi, General Nikolai Abroskin said that his organization had a 10-billion-ruble increase in its 2008 budget, even though at the time, these money were not allocated specifically for Vostochny, as the current three-year budget had been approved by the Duma (parliament), before the decision on Vostochny had been made. Nevertheless, Spetstroi joined a working group on the development of the facility. On June 7, 2008, Abroskin told Russian media that Spetstroi had received an official invitation from Roskosmos to become a prime contractor in the development of Vostochny, "several days ago." On April 11, the eve of Cosmonautics Day, the outgoing Russian president Vladimir Putin chaired a meeting of his Security Council (known in Russian as Sovet Bezopasnosti), with the official goal of considering various aspects of the Russian space program until 2020. According to Anatoly Perminov, the head of the Russian space agency, although Russia had committed to stay in Baikonur until its current agreement with Kazakhstan would expire in 2050, the Security Council established the year 2015 as the "solid date" for the first launch from the new launch site in Vostochny. (Previous statements quoted 2016 as the date of the first launch from the site.) In the wake of the meeting, the Kremlin press service also quoted President Putin requesting additional funds for the current federal budget, which would allow immediate development in Vostochny. During the summer 2008, Roskosmos and its chief research centers, TsNIIMash and ITs Keldysh evaluate the "system project" for Vostochny. At the same time, an expert commission of the Russian Academy of Sciences had prepared a positive assessment of the completed design work. The project confirmed the necessity for the development of a new medium-class launch vehicle with "upgraded cargo capacity," Roskosmos announced. On July 11, 2008, the collegial meeting of the Russian space agency reviewed the "system project" of Vostochny. It reportedly included representatives of the Defense Ministry and Moscow Aviation Institute, MAI, Russian Academy of Sciences and other organizations. According to Roskosmos, participants called for the completion of the preliminary research into the basic concept of the next-generation manned spacecraft and its medium-class rocket. The most critical issue of the project would be the choice of a rocket engine with enough engineering potential to be later used in the development a heavy-lift and super heavy-lift launch systems, the agency's statement said. No surprisingly, the Russian press characterized the "system project" primarily as a detailed construction schedule, rather than an architectural blueprint. At the end of November 2008, a surveying commission including representatives of the TsENKI ground operations center, OAO Ipromashprom, Spetstroi and TsNIIMash research institute toured the site, to establish the exact locations of future facilities of Vostochny cosmodrome. In April 2009, the head of Roskosmos Anatoly Perminov told Vesti TV channel that the chairman of the Russian government recently had held a meeting on the subject of Vostochny and that all research and survey work at the site was going as scheduled. Despite some previous reports about cuts in funding for Vostochny, Perminov reassured that money had continued to flow. He also said that at the time, the agency had been conducting monthly meetings with Spetstroi and other contractors involved in the project. On June 3, 2009, a 47-member team of officials from Roskosmos, TsNIIMash, Glavspetstroi, Kazanski giproaviaprom and Mospromtrans-Proekt, among other organizations, arrived in the Uglegorsk area, Amurskaya Pravda reported. The official goal of the five-day trip was to narrow down the locations of the major facilities of the future center and prepare formal "justification for investments." (337) According to Komsomolskaya Pravda, the locations for the launch pad, processing complex, airport, meteorological and tracking facilities as well as for downrange impact sites would be evaluated. (338) The resulting documents were to be submitted for Russia's state expertise during 2010. The governor of the region, Oleg Kozhemyako, was also in town for a meeting with the municipal heads of Svobodny, Shimanovsk, Uglegorsk and the regional minister of the Vostochny construction, Konstantin Chmarov. A wide range of issues related to the construction of the center was reportedly discussed. (337) At the time Chmarov said that due to economic problems, previous plans to start the construction ahead of schedule (in 2010 or 2011, according to various sources) would not materialize and it would not be initiated before 2012. (338) In the wake of the meeting, the regional government announced that Kozhemyako had directed local administrations to accelerate reservation of land for the future center. (339) Echoing previous doubts, at the end of 2009, the official ITAR-TASS news agency reported that Vladimir Putin, (then in the capacity of a prime minister) "admitted that Vostochny was an expensive and complex project." However Putin was quoted as saying that "still for Russia, with its huge territory, this (project) makes sense and we would allocate some modest funds for preliminary development now." During a visit to the site in July 2011, a newly appointed chief of Roskosmos, Vladimir Popovkin, promised 20 billion rubles for Vostochny during 2012. (492) A month later, the head of Spetstroi, Grigory Naginsky told the press that first blueprints for the center went through the project expertise and the first contract worth 1.6 billion rubles was signed with Roskosmos, covering the construction of the railway line and the road. Naginsky also promised the completion of the initial make-shift housing for construction workers at the site by October 1, 2011. At the time, the beginning of construction slipped to September 2011, with the bulk of the work no expected to begin until the second quarter of 2012. According to plans announced during 2008, the Vostochny launch site was to sport a total of seven launch complexes. It could be inferred from the official statements that the "wish list" for the future space center included a launch complex for a "man-rated rocket," with two pads and another facility for a heavy-lifting rocket, to support lunar expeditions. 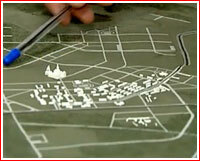 According to the official Russian government description of the center in 2010, a total of 10 technical and support sites (ploshadka) were planned for development. At the time, Prime-Minister Vladimir Putin promised a total of 150 kilometers of new roads to be built at the new space center and the same length of railways. 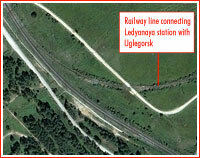 (A later official statistics listed 115 kilometers of internal roads and 125 kilometers of railways.) At the same time, Russian space officials emphasized that the new launch site would occupy an area of 700 square kilometers or 10 times smaller than that of Baikonur (6,717 square kilometers) and three times smaller than Plesetsk (1,762 square kilometers). The initial support infrastructure of the center also would include an oxygen and nitrogen production plant. In January 2012, the head of oxygen production station an NIIMash research institute in Nizhniya Salda near Sverdlovsk said that the facility had been considered as a backup supplier of oxygen to Vostochny. (543) Given the use of liquid hydrogen onboard Rus-M, Roskosmos had asked developers in the course of the Technical Project during 2011 to evaluate whether the construction of a hydrogen production plant in Vostochny would be more economical than the delivery of this cryogenic propellant from another location. Electric power to the center would be supplied from the newly completed Nizhne-Bureiskaya power station. (414) According to requirements for the Technical Project of the Rus-M rocket formulated in 2010, the processing complex in Vostochny would need to have three independent power supply sources. Two lines would come from outside, while a third "guaranteed" diesel power generator would be a part of the processing complex itself. 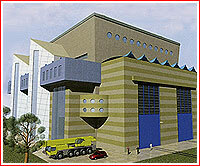 It would provide electricity to the most critical parts of the building, in case of power cuts on main lines. Requirements for the Technical Project also confirmed that the launch complex for the Rus-M would include two launch pads, supporting 20 missions annually. Preliminary geodesic survey placed the complex at 51 degrees 52 minutes 32 seconds North latitude and 128 degrees 21 minutes 43 seconds East longitude. In the course of the Technical Project, the agency requested developers to evaluate the possibility of using the Mobile Service Tower, MBO, for lifting and installation of the payload section onto the rocket on the launch pad rather then in the assembly building. As of 2007, the Russian press identified unpopulated areas in Yakutiya as the drop zone for the first stages of rockets and the Arctic Ocean as the impact area for the second stage. During the 1990s, the Yakut administration apparently protested the construction in Svobodny citing potential environmental damage from toxic debris. According to the Russian government, a tracking network supporting Vostochny would have a sea-based component -- apparently tracking ships. 1997 March 4: In the first launch from the site, a Start-1 mobile and lightweight booster converted from the Topol ICBM, delivered the Zeya experimental satellite into orbit. 1997 Dec. 24: A Start-1 launched the EarlyBird imaging satellite for the US company Earth Watch Inc.
2000 Dec. 5: A Start-1 booster successfully placed the Israeli-built EROS-A1 commercial imaging satellite into sun-synchronous orbit. 2001 Feb. 20, 11:48:27 Moscow Time: A Start-1 booster launched the Odin research satellite. 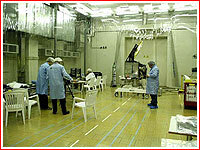 2006 April 25, 20:46 Moscow Summer Time (16:46 GMT): (planned time: 20:47:16) A converted ballistic missile delivered an Israeli remote-sensing satellite, after a blastoff from a launch site in the Russian Far East. The Start-1 launch vehicle, carrying the EROS-B1 satellite, blasted off from a mobile launcher deployed at Svobodny. The payload entered a nominal 508-kilometer circular polar orbit with an inclination 97.3 degrees toward the Equator approximately 16 minutes after the launch. The solar panels of the satellite were successfully deployed some 30 seconds later. The mission of the EROS-B1 received more attention from the media than that of its predecessor, in light of recent threats to Israel from the Iranian government. The world press has emphasized that the Israeli military, as one of the major customers of satellite's data, could use it to monitor Iran's military activities, including its nuclear and missile programs. 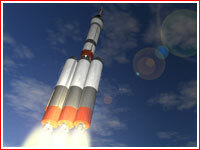 The launch was delayed from the fourth quarter of 2005 and March 21, 2005. 2007 Nov. 6: President Putin signs the decree on the Vostochny development. 2008 February: The Russian space agency approves the "Plan of priority actions for the implementation of the Presidential Decree on the Vostochny development." 2008 Feb. 27: Roskosmos approves the "technical assignment" to TsNIIMash research institute on the development of the Vostochny launch site. 2008 June: Scientific councils at TsNIIMash and Keldysh research center evaluate materials for the system project of the Vostochny launch site. 2008 June 20: The Presidium of the Scientific and Technical Council at Roskosmos evaluates and approves the system project for the Vostochny launch site. 2008 July 11: A collegial meeting of the Russian space agency reviews "the system project" for the Vostochny launch site. 2008 Nov. 27: The surveying commission completes the work to narrow down locations of construction sites for future facilities of the Vostochny cosmodrome. 2008 Dec. 3: The Secretary of the Russian Security Council Nikolai Patrushev, the Presidential Envoy to Far Eastern Federal District, Oleg Safonov, and the Governor of Amur Region, Oleg Kozhemyako, inspect the Vostochny area. 2009 Feb. 5: In Moscow, the head of Roskosmos, Anatoly Perminov, discusses the development of Vostochny with the governor of the Amurskaya Oblast (region) Oleg Kozhemyako and the Vostochny space port engineering and construction minister in the Amurskaya Oblast, Konstantin Chmarov. 2009 June 3: A 47-member commission visits the Uglegorsk region for the final survey of the area for the construction of the launch pad, its related facilities and the definition of future investments to be submitted to the government in 2010. 2009 Sept. 1: The Russian president issues order No. 562, assigning the responsibility for the Vostochny development to a single contractor – OAO Impromashprom. 2009 Dec. 28: Roskosmos signs order No. AP-272 "On reservation of land in the Amur Region for state needs with the goal of the Vostochny Cosmodrome development." The document allocates 103,546.6 hectares of land in the Svobodny and Shimanovsk districts for the spaceport project and limits any unrelated development or sale of private property within that area. 2010 June: The preliminary design of the Vostochny cosmodrome is completed. 2010 July 1: The work on the project documentation of the Vostochny cosmodrome starts. 2010 July 19: During his visit to RKK Energia, Russian Prime Minister Vladimir Putin pledges the renewed support of the Russian government for the funding of Vostochny. 2010 July 27: The Russian prime minister orders the submission of the latest revision for the Vostochny development concept within Federal Program of Launch Site development during 2006-2015 to the Ministry of Economic Development and the Finance Ministry for review and the following submission for approval to the government. 2010 Aug. 28: During his tour of the Russian Far East, Prime-Minister Vladimir Putin unveils a granite slab with the inscription "Here will be built a cosmodrome" at the site of the future Vostochny space center. 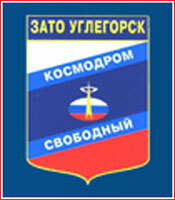 2010 Sept. 6: Roskosmos forms a branch of the TsENKI launch infrastructure company at Vostochny Cosmodrome. 2010 Nov. 11-12: A joint meeting of officials from the Amurskaya Oblast (Amur Region) and participants of the round table on Vostochny development takes place in Blagoveshensk and Uglegorsk. Deputy Head of Roskosmos, Viktor Remishevsky, and Deputy Chief of Staff of the Russian president, Yekaterina Popova, participate. 2011 April 7: OAO Ipromashprom announced that it signed a Federal contract for development work at Vostochny cosmodrome during 2011. 2011 July 5-6: A new head of Roskosmos, Vladimir Popovkin, visits Vostochny area for the overflight of the future construction site and consultations with officials and contractors. 2011 July 27: Roskosmos posts an announcement for a federal tender to develop Vostochny's support infrastructure. 2011 July 28: Presidential envoy, Viktor Ishaev, overflies Vostochny area and helds a meeting with local officials on the organization of the site construction.